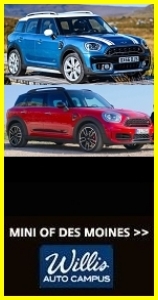 A full compliment of 29 MINIs and their owners from Eastern Iowa MINIs (EIM) and our good friends from the Central Iowa MINI Club (CIMC) all motored to Grinnell this past weekend to enjoy each others’ company and cars. For EIM, this gathering represented a continuation of our annual Spring has Sprung Meet-n-Eat held on the weekend following the first day of Spring. Although a bit chilly, we were certainly blessed with beautiful blue skies and dry roads as a welcome change! Thanks to Jeremy M. from CIMC for setting up the logistics with our venue for the day, the Grinnell Steakhouse. 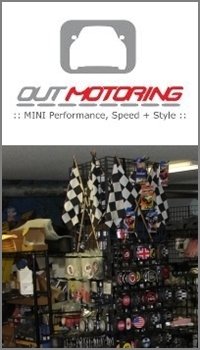 This location was superbly suited to accommodate our sizable group of motorists. Special thanks to Rob Melick, the Central-West MINI USA Regional Manager for joining us and for his informative presentation on the new F56 Hardtop, plans for this year’s MINI Takes the States (MTTS) 2014, ideas for a 2015 version of the MINIs on the Mack record attempt in the Midwest region, for the lively Q&A session, and for the special discounted rate offer to EIM and CIMC for participation later this year in the MINI Performance Driving School located at the Indianapolis Motor Speedway. All in attendance were greatly appreciative! 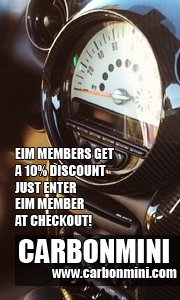 Congratulations to Jeff and Sue N. on their new MINI (see it in the EIM Member Roster). It was a neat surprise to see them roll up in their new wheels! We’ll be looking for you at Pikes Peak State Park on April 12th!